A diagnosis of cancer can be crippling both physically and emotionally. And when facing challenges that seem overwhelming, sometimes having something touchable to hold onto as a reminder of one’s inner strength can help make the situation more bearable. 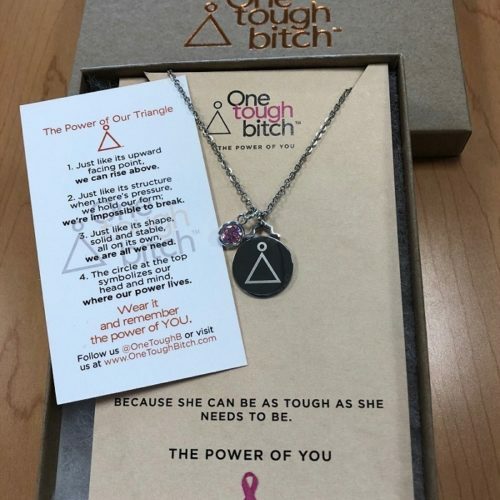 That was the premise behind the necklace created by Shelly Fisher for her own inspiration that has now blossomed into a booming business and, more importantly to her, a community. When fighting cancer for the second time in less than 10 years, Fisher said she felt an empowering mantra dominating her thoughts, writes Gary Puleo in The Times Herald. As provocative as the message was, Fisher didn’t flaunt it, but chose what some would call a more endearing way to keep it close to her heart. She wore the necklace, backwards, so no one could see the message. Only she knew what it said, and every time she felt that the mountain she had to climb was going to be a challenge, she held the necklace and found the strength within her to power through, she recalled. The public’s reaction and subsequent demand took her completely by surprise, she said.